Now that MAC has announced a second production run of the Bloggers' Obsessions collection, I can post more looks/swatches of the products without feeling bad! I never like to post products that I know you can't have/have to pay exorbitant prices on Ebay to get. But, MAC says they will have a waiting list on their website soon and you can hopefully get any products you missed the first time! So for this look, I layered Jealousy Wakes eye shadow over a black base, specifically MAC Style Black Greasepaint Stick (a LE item, but black bases are easy to find). I simply put the black base almost up to my crease, going a bit lighter on the black on the inner 1/3rd of my lid. Then I patted on Jealousy Wakes and went a little above the crease with Jealousy Wakes. I used MAC White Frost eye shadow as a highlight under the brow and in the inner corners of my eyes. On the lower lashline, I used MAC Undercurrent eyeliner (also LE), blended into White Frost. Using Jealousy Wakes on the lower lashline would give a similar look. 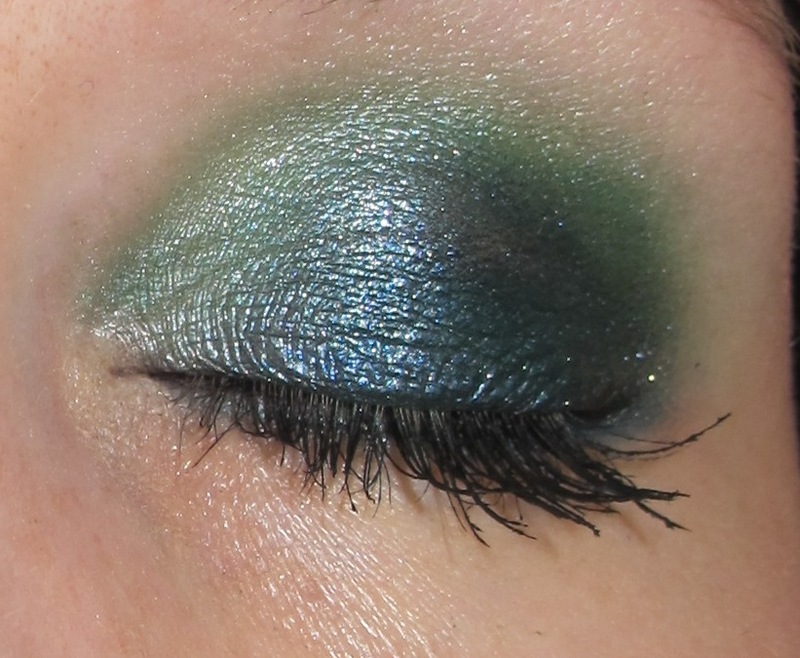 I LOVED this look, it's the perfect emerald smoky eye. It was also really easy to do and not at all time-consuming. I am still practicing taking pictures of my eye make-up and lips! It's new to me, so I promise I will get better. This look also looked a bit more blended in person, my camera really loves to accentuate flaws LOL. What do you think of this look? Will you be getting Jealousy Wakes when it is re-released? this is a gorgeous look on you! i couldn't pull it off, you're lucky! Thanks Kellie! Greens are hard for me to wear because I have green eyes, but the black base helped. Contests and such- I know what you mean, a lot of black bases are oily-ish, so they do crease. MAC's Greasepaint Stick does crease on me too, but not too badly. I really hope my american friend will take this one for me when there will be the restock!!! I love it *__* and your look is gorgeous... it seems the green turns a bit blue teal on the black base,doesn't it? I hope you can get it xasperadastra! It's lovely. And it does turn a bit teal over black, it's quite the multi-tasker!